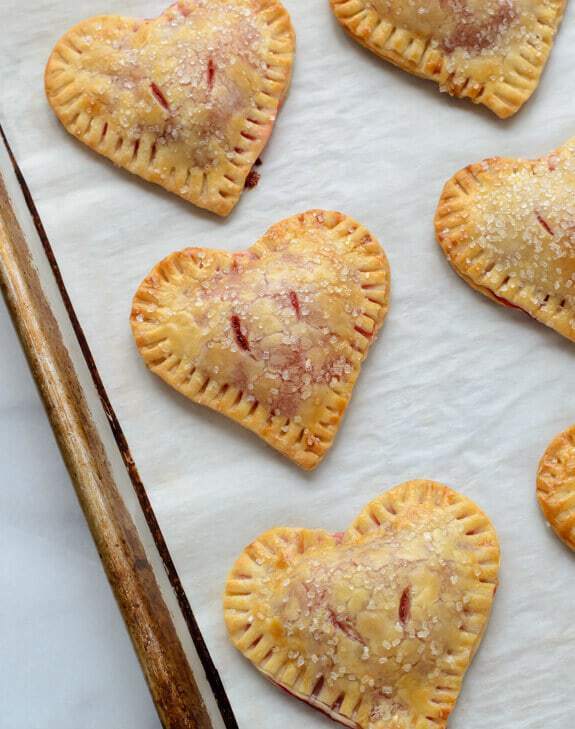 Why yes, we are in fact on our third consecutive Valentine’s Day recipe this week. I didn’t mean for this to happen—in fact, I’m positive this 2 Ingredient Quinoa Chocolate Bark would taste lovely cut into standard chocolate bark rectangles—but Martha Stewart had other ideas. You can blame (or thank) her for the hearts. Although I grew up watching Martha Stewart religiously with my Grammy, I’ve never internalized Martha’s passion for time-consuming flourishes. It’s admirable that Martha hand makes intricate origami valentine cards and festoons her four-layer cakes with delicately spun sugar, but I’m more of a smear-the-icing-on-the-cake-and-hide-the-ugliest-part-in-the-back kind of gal. I’m not proud; I’m not ashamed. It’s just me. Thus, when I spotted a recipe for homemade heart-shaped Crunch bars in Martha Stewart Living, I surprised myself the most when I immediately stuck the page under Ben’s nose with an emphatic, “I have to make these.” Perhaps it was the Valentine’s Day fever; perhaps it was having a fresh excuse to eat chocolate bark. Whatever the reason, I’m pleased to have a stash of 2 Ingredient Quinoa Chocolate Bark in close proximity. 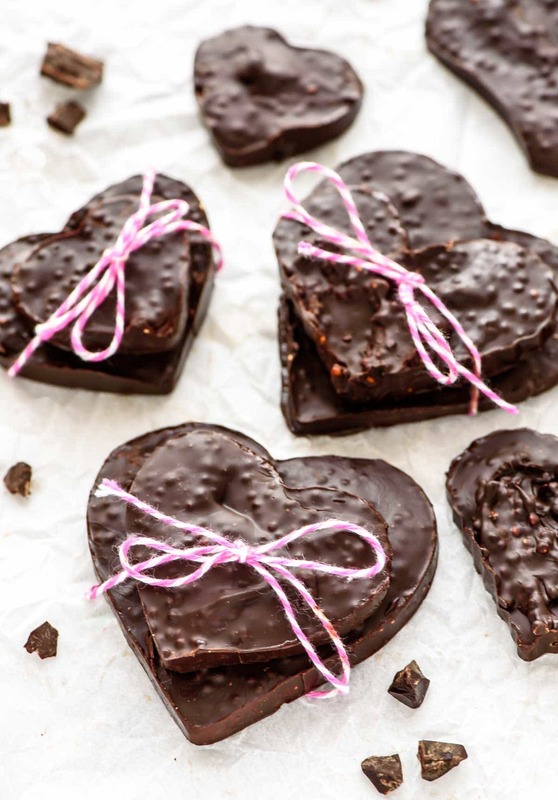 Martha made her “crunch bars” as she called them with sautéed Israeli couscous, but I didn’t like their short three-day shelf life, especially since I envisioned the chocolate bark as an easy, make-ahead Valentine’s Day gift. This 2-Ingredient Quinoa Chocolate Bark is the result. It will last for weeks if stored in a cool, dry place and is completely gluten free and vegan if you use dairy-free chocolate, so more people can enjoy it too. As you might suspect, the two ingredients in this chocolate bark are quinoa and dark chocolate. Rather than adding uncooked quinoa directly the chocolate, which I worried would be tooth-crackingly hard, I started by puffing the quinoa on the stove. It was a fun experiment that turned into an addiction. 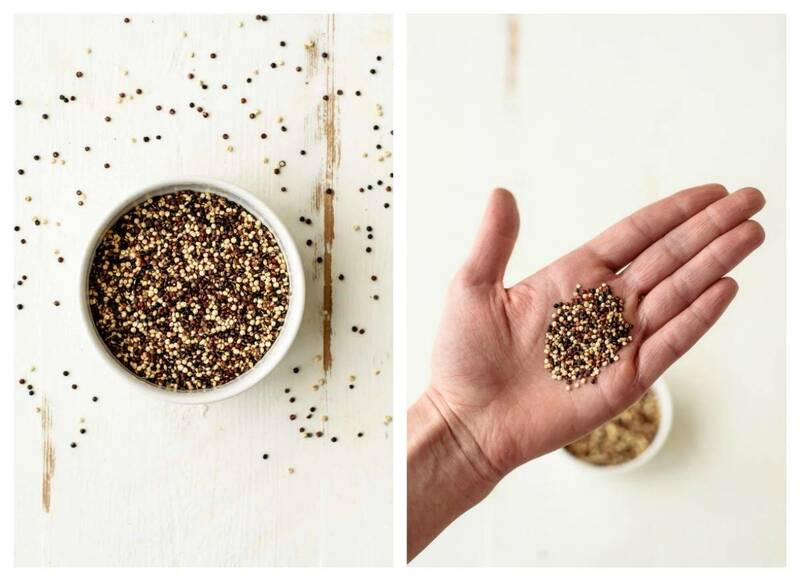 When placed in a hot pan, uncooked quinoa will “pop” or “puff” in a matter of seconds. The quinoa grains expand slightly, making them pleasant to munch, and they take on a toasty flavor and light, satisfying crunch. I’ve been loving puffed quinoa sprinkled on everything from my yogurt to my salads, and as I discovered, puffed quinoa tastes phenomenal folded into dark chocolate. For the chocolate, use a good-quality brand that you enjoy eating on its own. Since there are only two ingredients, the chocolate you choose is very important, because its flavor shines. I opted for a 72% ultra dark chocolate bar, which turned out to be aggressively chocolaty, even for me, a deep dark chocolate lover. In retrospect, I’d recommend something in the 60-65% range. Melt the chocolate on the stove or in the microwave, stir in the puffed quinoa, and you’re practically set. You can follow the standard chocolate bark recipe directions by spreading the melted chocolate bark on parchment paper to cool, then breaking it into pieces…or, you can dust off your cookie cutters and give them one more fun use. 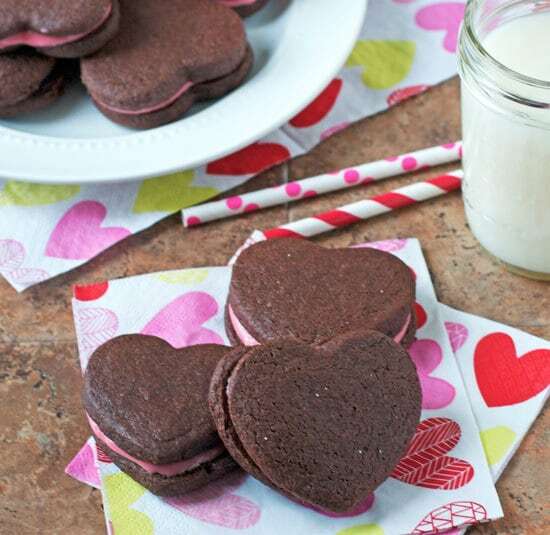 It took me just a few minutes to pour the melted chocolate into my heart-shaped cookie cutters, and once the chocolate had set, I was relieved to find them super easy to unmold. In fact, the whole process went so smoothly, I can see myself repeating this shaped chocolate bark theme for every holiday that has a cookie cutter to match. The smooth dark chocolate is a lovely contrast to the toasty crunch of the puffed quinoa. 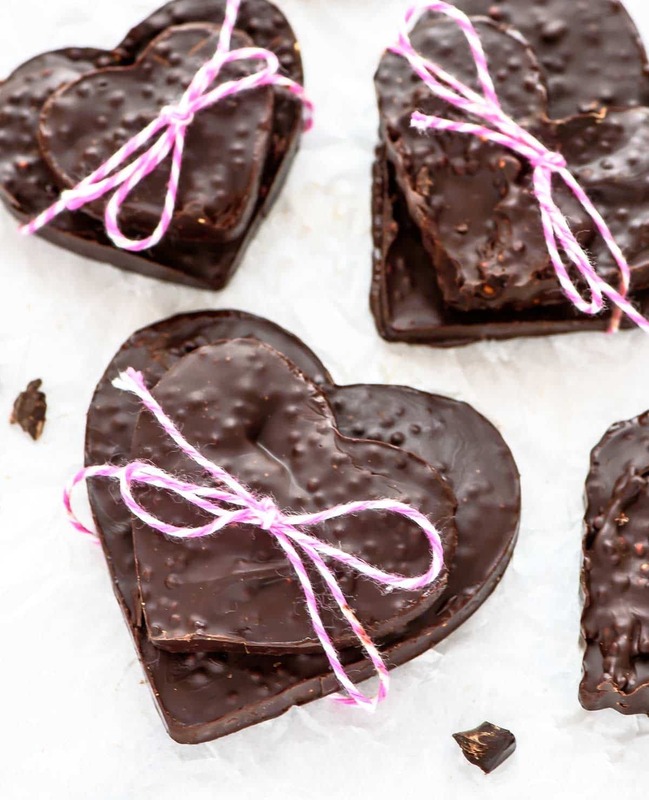 It reminds me of a grown up Crunch bar, and it would be a sweet treat to share with neighbors and friends as a surprise Valentine’s gift—provided you can keep yourself from munching the entire batch first. I’m not kidding when I say this crunchy chocolate bark is addictive! Creamy dark chocolate and crunchy puffed quinoa are an irresistible combo in this easy homemade chocolate bark recipe. Perfect for gifts or a healthy treat! Test your pot's temperature: Drop a small pinch of quinoa into the pan. It should pop within a few seconds. If this does not occur, adjust your pot's heat or wait a bit longer, until the test quinoa pops as described. Discard the "test" quinoa. Sprinkle a few tablespoons of quinoa over the pan's surface. Add only enough to coat the pan in a single layer, without crowding or overlapping the quinoa grains. As soon as the quinoa begins to pop (it may happen immediately), lift from the heat and shake the pan to agitate the grains. Continue shaking the pan off the heat, then as soon as the popping sound almost stops, pour the grains into a bowl or rimmed baking sheet (if you leave them in the pot, they may burn). Repeat, toasting the quinoa in batches until you have made the desired amount. If the quinoa tastes or smells burned, it has been overheated or left in the pan too long. Discard, as it will cause your chocolate bark to taste bitter. Melt the chocolate in a heatproof bowl set over a saucepan of simmering water (do not let the bottom of the bowl touch the water), or melt it in the microwave in 20-second bursts, stopping to stir the chocolate between each. When only a few small pieces of chocolate remain, remove from the heat (or microwave) and stir until smooth, letting the residual heat finish melting it completely. Fold in the puffed quinoa. To make chocolate bark shapes: coat a cookie cutter of any shape with cooking spray, place it on a baking sheet lined with parchment paper or a silpat mat. 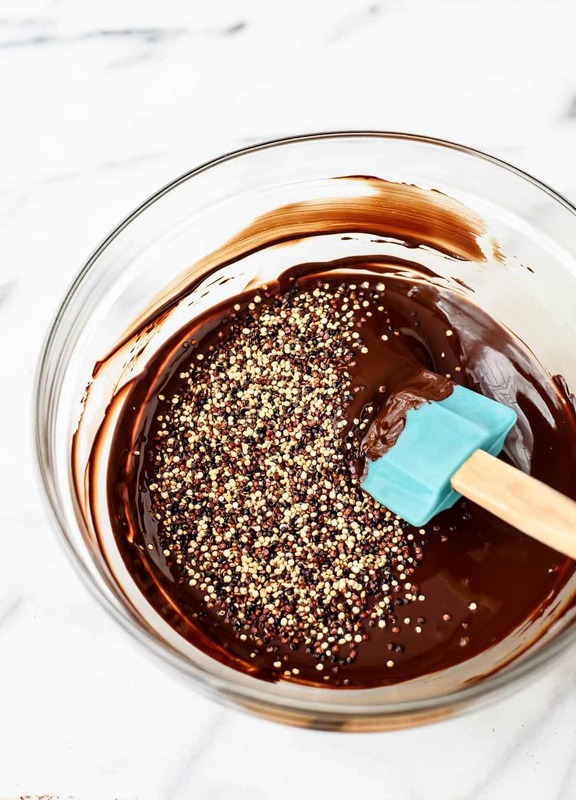 Pour the chocolate and quinoa into the cookie cutter, then sprinkle with a pinch of salt, if using. 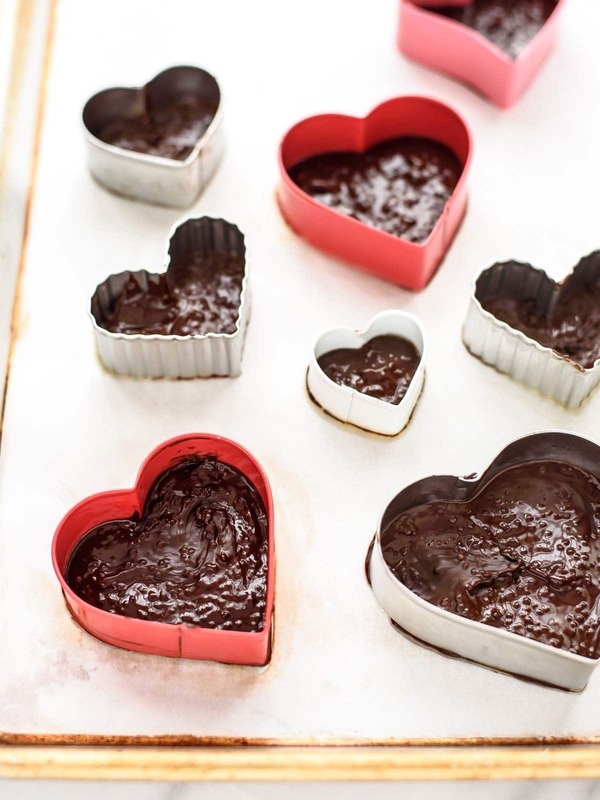 Alternatively you can spread the chocolate in a single layer on a parchment or wax paper–lined baking sheet. Place the baking sheet in the refrigerator for 30 minutes to allow the chocolate to set. Gently remove the chocolate from the cookie cutters or, if making a single sheet, break the chocolate into pieces of desired size. Enjoy immediately. *Depending upon the type of quinoa you purchase, you made need to rinse it first to remove any bitter taste. I've found that quinoa sold in the US is usually pre-rinsed (sometimes the package will specify), and none of the brands I've tried have tasted bitter. Unless I were to buy quinoa from a bulk bin, I skip rinsing. If you do prefer to rinse your quinoa, it will need to dry completely before being puffed. You can accomplish this by spreading the rinsed quinoa on an ungreased baking sheet and baking it in a 100 degrees F oven for one hour, or by spreading it into a single layer and leaving it out to dry overnight. oh wow! This looks amazing! I love chocolate! This recipe might just break the internet. Quinoa in chocolate? Absolute genius, Erin! Crunch bars don’t have ANYTHING on this bark. What a great idea Erin!! I’m the queen of cookie cutters and can see many shapes being made with your idea. I also thought as you may have already done chocolate mounds would work beautifully as well. Sandra, I hope you have fun both making AND eating these! This is a really clever idea!! I have to admit, I’m not “in love” with quinoa (it’s fine) but I just keep buying it. I think this is exactly what I want to do with it. :) ALL OF IT. Can you puff the quinoa a day in advance? Once the chocolate is mixed in and it’s set, will it last for a day or 2 without getting mushy or weird? Hi Audra! You can puff the quinoa even a week in advance. And no, the quinoa doesn’t get mushy. These will last in a cool, dry place for a few weeks. I hope you enjoy the recipe! I LOVE Bark Thins dark chocolate sea salt almond bark (so much that I buy it in bulk from Costco–I love sweet + salty foods! ), but I feel like this recipe would be so much healthier, cheaper, and tastier! Just wondering if anyone has tried adding sea salt to this, and if so, when (to the quinoa? to the final product before it solidifies?) and how much? Hi Jen, I think a pinch of flaky sea salt sprinkled over the top before it solidifies would be a delicious idea! Did you rinse the quinoa before pufffing? Hi Jane! I didn’t rinse my quinoa, but if you would prefer to do so, I include the steps in the notes section below the recipe directions. I hope that helps! I’m so glad to hear they were a hit, Mir! Thank you for taking the time to leave this awesome review!